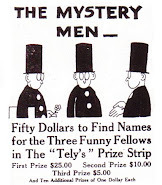 A Crowded Life in Cartooning owes a lot to serendipity. June, 1967, a sunny, gorgeous Spring day. I was a high school senior at Northern Valley Regional High School in Old Tappan, NJ. School let out early for seniors, because the senior prom was that night. I started to drive home, thinking this was too beautiful a day to mark time and shuffle around with friends. Neither did I really want to stare at my rented tux till witching hour. Northward I drove, into the town of Piermont on the Hudson (where years later I ran an antiques shop); Tappan, where Major John Andre was hanged for plotting with Benedict Arnold during the Revolution; and other quaint New York towns just over the state line. In the little town of Stony Point I spotted an old barn that presented itself as a crafts and collectible shop (probably “shoppe”). I felt lucky, not merely aimless, and often have followed my instincts at flea markets and used-book stores. Thee place offered more local crafts than old artifacts, but one painting on the wall caught my eye. 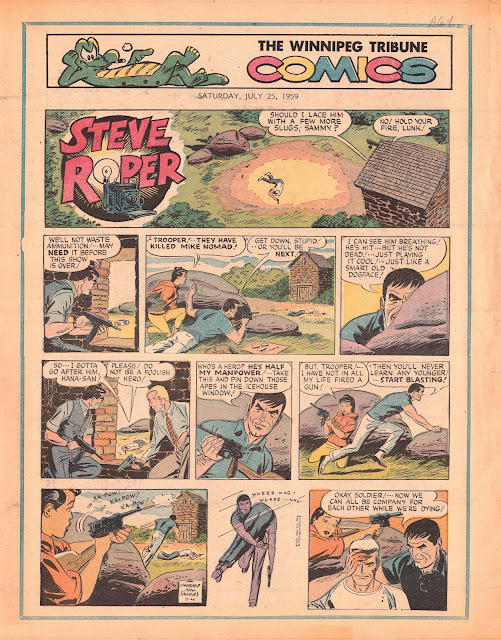 My local paper, The Record, ran Steve Roper – written by Allen Saunders, drawn by William Overgard. The signature was his; what a coincidence. I asked the guy behind the counter if he knew Overgard. Yes. Did he live locally? Yes, just up the hill. I introduced myself as a comics fan, and wondered if I could borrow the shop’s phone and call Mr Overgard. “Sure.” Serendipity. 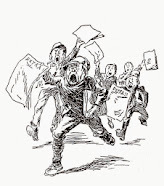 Mr Overgard answered the phone, and I went through the same story I had just spieled, but added a few bona fides about cartoonists I knew and some of the work I had done. As he lived less than half an hour from my house, I was to visit Bill Overgard more times, even though I left for college a few months later. We kept in touch, and a few years later I was his Comics Editor at Publishers Syndicate in Chicago. One of the brush fires I was hired to put out was Bill’s feud with Allen Saunders. It was decades old. Saunders wrote the strip that Overgard joined in 1954, and his scripts came in the form of pencil-sketch panels – the plotting, pacing, composition all laid out (with Saunders’ insistence on compliance), and with bubble-headed characters, no less; for that was the extent of Allen’s artistic talent. Overgard considered himself a writer (indeed he wrote paperback action novels and screenplays), and he wanted a wilder feel to Roper. In two years he prevailed upon Saunders to add a roughneck sidekick for the urbane newsman Roper, and thus Mike Nomad was born, a crewcut beefcake who soon dominated the strip and eventually shared the title. Closing circles, in serendipitous ways, a few years later I received a call from Sid Goldberg, my old chief at United Features Syndicate. (Sid’s wife Lucianne was on an ABC-TV special this week as the provocateur who prodded Linda Tripp to prod Monica Lewinsky to save the blue dress with Bill Clinton’s ick on it) – Sid has just signed Bill Overgard to draw a strip, Rudy, about an insouciant talking chimp in La-La Hollywood. Overgard had left Roper around 1985, succeeded by my old friend Fran Matera, whom I had tried to connect to Publishers when I was Editor. Cartoonist/columnist Harry Neigher, a mentor of mine, had introduced us. Fran, back in the day, had drawn Dickie Dare, succeeding Milton Caniff, Coulton Waugh, and Mabel “Odin” Burwick. Rudy was a terrific strip, full of outrageous sarcasm, in-jokes, parodies, and double-entrendres. Sid knew it would be a tough sell… and it was. He asked if I would help promote it – not even knowing my friendship with Bill Overgard. But I truly liked the strip – Sid muscled a reprint book of its first episodes – and I wrote glowing reviews. It was a sad day when the promising, eccentric strip died. A little while later, in further serendipity, Bill wrote scripts for ThunderCats at the invitation of Leonard Starr. He had also invited me and Ron Goulart to write scripts for the TV cartoons; I later learned that Larry Kenny, country disc jockey who also lived in Westport and was in the Imus in the Morning cast, was one of the characters’ voices. I suppose I would have gotten to know Bill Overgard eventually, since he was in the stable of Publishers Syndicate. Yet I likely would not have developed the friendship we had, and probably not have visited that fabulous farmland and Colonial home in Stony Point – a part of the world he fell in love with whilst briefly working for Milt Caniff in nearby New City. Piermont, Tappan, Sparkill, Stony Point… all those wonderful towns in the Palisades-hugging rural New York State. The lower Catskills of Rip Van Winkle legends. It seemed, and still does, unbelievable that their winding roads, dense trees, and old barns are a mere 45 minutes from Broadway. To me – despite the fact it is not on any map, nor possessing a postal code – it will forever be the place of Serendipity. [By the way, I donned the tux and barely made it to Sue’s house, and the prom, in time. Another off-script serendipity occurred after the prom. Many kids went “upstate” afterwards – living on the border of New Jersey, seniors were attracted to bars where the drinking age was a year lower – but I suggested we do something different. No, not that. Being so close to New York City, we drove to Fort Lee on a lark, and walked across the George Washington Bridge. Around midnight, she in her gown, me in white jacket and boutonniere. [I heard on the car radio that the United Nations Security Council was meeting in emergency, overnight session. The Six-Day War! A crazy idea formed after I dropped Sue home… and I drove back to the George Washington Bridge, and headed south on the FDR Drive. How could I miss a chance to witness history? Around the UN there bizarre claques of protesters and celebrants, but I worked my way through… and actually secured a gallery pass. I sat in the balcony till dawn, listening to delegates’ speeches (I recall Jamil Baroody of Saudi Arabia decrying Western influences in the Middle East: “We don’t want your hots dogs and mini-skirts”), through the overnight emergency session, sitting there in a white tuxedo jacket.